The RAF's Hawker Siddeley Harrier GR1s had entered service in April 1969. 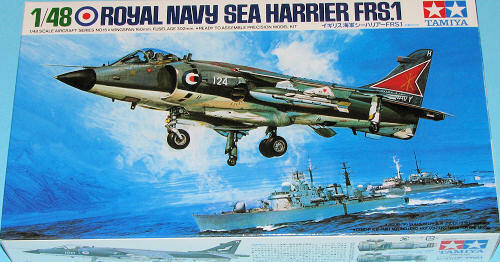 In 1975 the Royal Navy ordered 34 Sea Harrier FRS.1s (later FRS1)(Fighter/Reconnaissance/Strike Mk. 1), the first of which entered service in 1978. In total 57 FRS1s were delivered between 1978 and 1988. The FRS1 was largely based on the Harrier GR3, but was modified to have a raised cockpit with a "bubble" canopy (to give better visibility for the air defence role) and an extended forward fuselage to accommodate the Ferranti (now BAE Systems) Blue Fox radar. Furthermore it was manufactured in alloys better suited for a maritime environment. In the late 1980s/early 1990s, 34 FRS.1 Sea Harriers were upgraded to FA.2 standard and served with 18 new build FA.2s. The last FA.2 was delivered in 1998 and the last Sea Harrier was retired in 2006, only 8 years after the newest one was delivered. This ended the Royal Navy's long fixed wing carrier aircraft history with RAF planes now performing that task, something very reminiscent to WWII and prior when Royal Navy carrier air assets were controlled by the RAF. This kit is not Tamiya of today. Though the detailing (raised panel lines) is quite good and actually somewhat too petite in some areas, it is not to today's standards. The attachment points for all the under wing weapons and pylons is overly beefy with huge attachment points. The cockpit is very basic with tub, generic seat, control stick and pilot. No instrument panel is provided. A full engine with the nozzle linkage built inside it is provided. Nose gear is molded with the wheel in place. O ne has the option of guns or strakes for the underside of the fuselage. As mentioned, the weapons pylons are quite beefy. Two drop tanks, four bombs with carrier and a pair of Sidewinders are offered as weapons. The canopy is clear and large with the frame being a separate item that is glued in place. Tamiya offers instructions in both English and Japanese. They are easy to follow and should provide not surprises on what is admittedly a pretty simple kit. 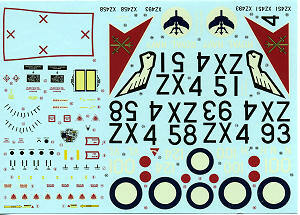 Markings are provided for all three squadrons that flew the Sea Harrier: 899, 800, and 801. The markings are for the Extra Dark Sea Grey over White scheme. Decals are well printed but are your standard slightly-ivory colored white versions. I'm sure there is some sort of shape problem with it somewhere as the pundits generally prefer the Airfix version, but that may be due to the better detailing of the later molded Airfix kit. 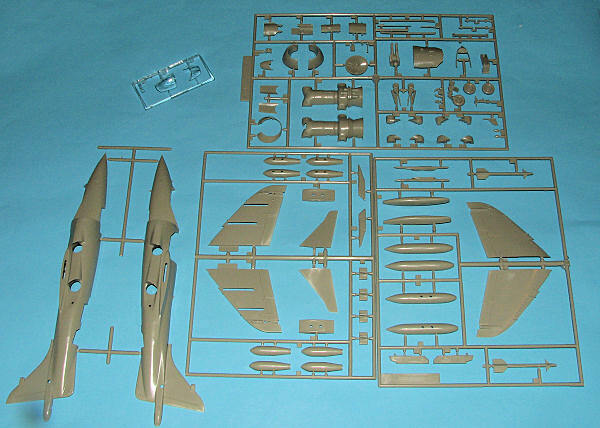 This particular kit is not difficult to find and is generally quite inexpensive compared to more modern kits. It offers all you'd need and while the detailing may not be 21st Century standards, for most of us, it will make a most acceptable model to place on our shelves. My thanks to www.coopersmodels.com for providing the preview kit. If you would like your product reviewed fairly and fairly quickly by asite that has over 300,000 visitors a month, please contactme or see other details in the Note toContributors.